A half-hour walk twice a day is the usual advice. But you need to take your puppy’s growth rate and body shape into account, too. It might seem as though your puppy’s fitted with long-life batteries, but they also need plenty of rest to grow. The bigger your puppy, the more prone they are to joint disorders and young dogs can develop serious health problems if they’re over-exercised. If you set off too fast, both you and your puppy could end up stiff and tired. After-walk care is important too: you’ll need to provide shade and cool water on hot days and a warm, draught-free place for snoozing in the winter. Regular exercise isn’t just good for your puppy’s body. It also keeps them from being bored, preventing destructive behaviour. Including plenty of training sessions in your dog’s exercise routine is a great way to do this. It’s a good idea to teach your puppy early on how to walk on the lead, at “heel” next to you, rather than letting them drag you along. Try out the tips in our Training Academy video to see how it’s done. Toys like balls and Frisbees are fun for both of you. But don’t yank anything out of your puppy’s mouth, as young teeth can’t take vigorous games just yet. Puppies are usually most active in the mornings and evenings, so it's best to exercise them then – before they have their meal. 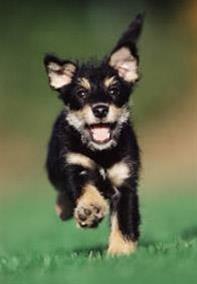 If the weather’s bad, shorten the walk but try not to skip it as your puppy will miss their routine. An evening walk should mean that your puppy will be nicely relaxed when you need them to be.